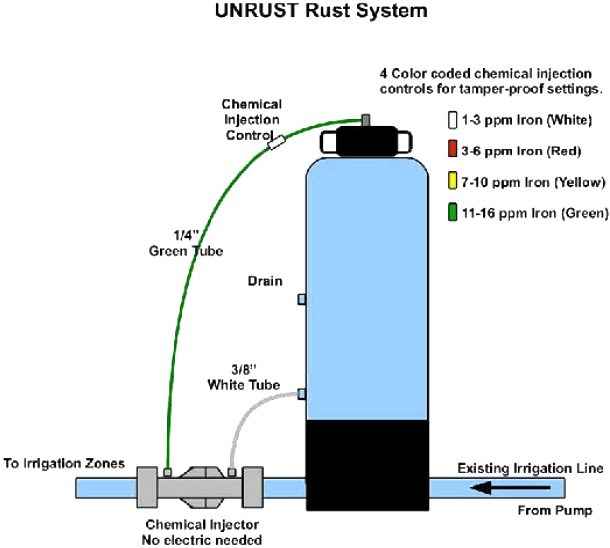 UNRUST Rust System | Stop high iron irrigation RUST stains! We have some as high as 30 ppm iron! Do you need to fertilize? 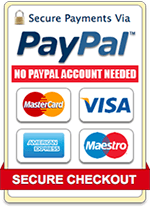 Use this same unit to do it for you. 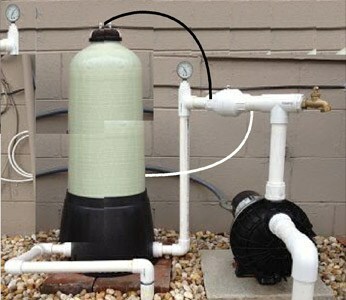 Installs in minutes; NO electricity, No pump, No ugly tank. 500 hours of run time before any chemical is needed! 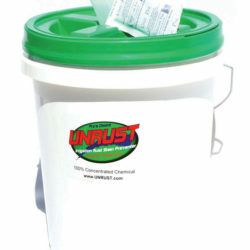 Easy to install, the UNRUST Stain Preventer is mixed automatically. The Rust System that does it all. 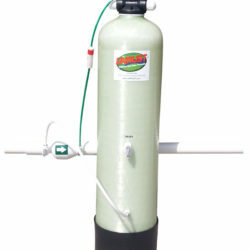 Works on an in-ground pump or an above ground pump. Never loose a pump again, because your tank ran dry. You do not need a peristaltic pump like a stenner pump, pulsafeeder pump, or lmi pump for your sprinkler system. It will keep your lawn sprinklers from spraying out rusty water. 500 hours of rust free irrigation, based on the smallest setting, before you need to add any more chemical. If your iron level higher the hours will be less. 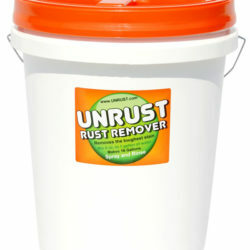 The UN-5 gallon dry UNRUST Stain Preventer is added to the UNRUST Rust System. The dry chemical is wetted out in the tank to make a brine concentrate. 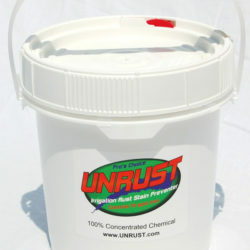 DRY UNRUST Stain Preventer is loaded into the UNRUST Rust System. 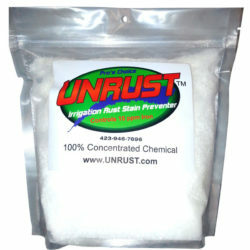 When the irrigation pump comes on and water starts to flow the concentrated UNRUST Stain Preventer is injected into the irrigation water at a controlled rate. The amount of UNRUST Stain Preventer added to your irrigation water is controlled by a flow control that is color coded for the iron level in your irrigation water. 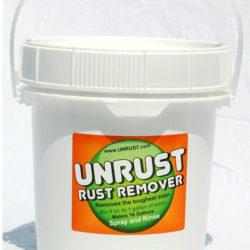 Fill UNRUST Rust System with 5 gallon of dry UNRUST Stain Preventer. Then fill with water to about 2 inches from the top of the tank. Then screw on the lid and you are all set-up. You will need to check the amount of UNRUST Stain Preventer you have in the tank, to do this you can shine a flashlight on the other side of the tank and see the level or you can remove the lid and use a dip stick to check. You will be able to feel a sludge in the tank, this is normal. 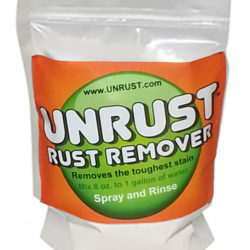 Remember the dry UNRUST Stain Preventer will be a wet sludge. NOTE; The chemical injector unit can be mounted in any fashion; up, down, or side-ways. Here is a video of the UNRUST Rust System being installed on an above ground pump.